A lack of organization can really kick you in a sensitive area if you’re on a time crunch or are called to produce a photo or document of some sort. So here’s a tip: don’t be a digital slob! You might be a digital slob if your desktop is littered with a bunch of folders and files to the point where you can’t see the beautiful wallpaper that is supposed to be displayed underneath. You might not be a complete slob if it takes you more than 5 seconds to find a file or folder on your desktop, that just means that you’re one of those organized chaos people who have some hope. I’ve been really into workflows as of late and have been helping people become a little more efficient and organized. Yevgeniy is a very talented working portrait photographer (check out his work– https://www.yevzphotography.com) that tends to have a lot of files to edit, tutorials to keep improving his skills, and other digital projects on his plate. Due to having all that going on, he happened to be the best specimen for some organizational tweaking. I’m thankful that he’s allowing me to put him on blast for this. I had started helping him with some technical support on his 27″ iMac (that has a ridiculously large space for icons on the desktop). I can say that his photography skills are infinitely better than his organizational skills– but as you can see, the screenshot of his desktop is a mild case of congestion– not a desktop of a complete slob. But this image was after a couple other steps that make things a bit easier to read. See below! I told him about an idea that I had from an old program that I used back in the day, called Fences, that allowed you to create areas or containers on the desktop where you can store files. It is nice to use–if you have a Windows machine. 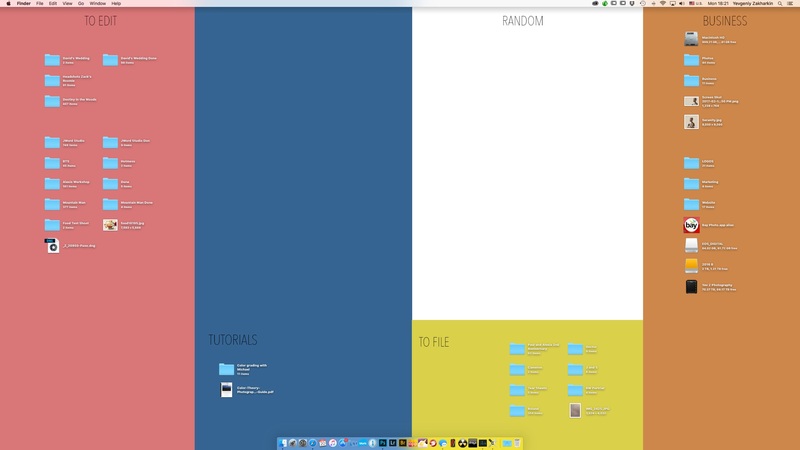 A cheaper and easier way to organize your desktop is simply achieved by creating a wallpaper that is compartmentalized by using different blocks of colors — and that’s what Yev did. He labeled it in a way that he liked and that worked for his workflow. Everyone’s brains work a little differently so get some ideas and work the way that fits you best. On a Mac, you have the options to adjust the grid that icons could automatically snap to– things like size, spacing, and info are super important. Right click (two-finger click, or secondary click), an empty area on the desktop and choose Show View options. Adjust the sliders as you see fit– but make sure there are icons on the desktop so you can see what the sliders do! For your convenience, here are my personal settings for the desktop– it’s quite similar to what Yev has done on his machine. I personally like the Label Position on the Right. It shows more useful information regarding the size of a drive and free space, resolution of images, number of files in folders and occasionally other random information. Use the Grid Spacing to help line up the icons into the sections, and adjust the size of the icons afterward. That’s what worked for me. So I personally like the compartmentalized look. Basically, you can make things look prettier if you add some shapes and text in Photoshop then adjust the opacity. Pick up this free template to get you started! You can add your own wallpaper as a base layer, or choose a solid color. I’ve included left, middle and right columns with two different sizes for the boxes. Add text boxes to make things look a bit more organized like Yev did. Good article! I am over and over confronted with messy desktops and I am also educating people in this direction. One thing I might add from the Windows side. If you keep your files on the desktop, you have to be aware that the desktop is a folder inside the “My Documents” folder which, be default, resides on the C: drive. That’s very dangerous. Because when your computer crashes, the C; drive could, and most likely will be affected. If it ends up being corrupted beyond repair, you will loose all data that is on the C: drive. Also your desktop. There’s two ways I suggest to people. a) You can move the “My Documents” folder to another drive. If you right click the folder and click on the tab “Location” you can click “Move…” and move it to a secure location. Or b) don’t use the desktop at all for real files. Keep them in well archived folders on another drive than the C; drive and only have shortcuts on your desktop. Which reminds me, for the Mac side running macOS Sierra– if you have iCloud Drive turned on for your Desktop and Documents folders, then in the event of a hard drive crash of some sort, your Desktop is in iCloud! Yay for worry free solutions! Great to see like minded organised people! I developed a template in panels like illustrated here, and then got creative and now have a more photographer themed desktop image that I designed on Photoshop with areas for important stuff to sit…knowing your weak points you can put forethought into the size of each compartment…keep particular ones small to remind yourself not to get sloppy or keep bad habits in certain areas…like for me not everything needs doing ‘today’…also having aliases or shortcuts instead of the actual folders is probably good for speed and definitely good for filing.